Football Friday Week 2: Too much to Bear? Greetings Cougar Nation and Brinkhater Army. So, on we march into the Crap-10 opener against CAL. As we saw last week against MSU, CAL has reloaded with speed on offense, appears to have (not long) shored up their quarterback position, and is surprisingly porous on defense. In spite of their vulnerability on the defensive side of the ball, this is a game that CAL should win easily when you take our performance last week at face value, and within, without reading between the lines. What is fun about this game, however, is that we will see what if any of those hidden subtexts from last week show up this week. For example, did anyone else notice that we were a perfect two for two in the red zone last week? Does that portend anything for this week if we’re able to move the ball consistently? I sure think so, but we’ll have to see. Moreover, what is CAL’s mind-set coming into this game? On one hand, you know that Tedford will try to fire up his troops about the importance of winning ANY road games in the Pac. On the other hand, can you expect any 19 or 20 year old to take us seriously after watching us piddle to 190 yards of total offense while giving up 250+ on special teams? I think that I would be HIGHLY prone to overlook us if I were on the other side. So, in view of all of these questions, I find myself falling onto the ole clichés in predicting our fortunes. After all, this season is about “process” and “improvement” and so this game figures to fall along the natural progression of a young team. In that way, I think you’re going to see more upside out of us this week, but as a part of seeing more upside, we’re going to have to open things up more—and I think that will lead to more mistakes—particularly from my main man, Gary Rogers. Although I think Gary will play better this week, I don’t think that he will make sufficient progress to avoid the “lock-on-itis” that we saw last week. And that will be our Achilles heel. Of course, if Rogers accelerates his own progress and if Anderson plays and is healthy, we could jump on em early and ride on to a shocking upset as a result. Quack 51 Utah State 10 Yuck. Penn State 38 Beavs 35. This one should be real entertaining, even though recent history suggests that the Beavs will lose this one 70-14 (and then finish 9-4). AZ 41 Toledo 18 Normally, this would be an upset special—especially given that the Mac looks up this year, but last week showed me a lot about the Mildcats. Sure, it was the spuds, but 70-0 is still stinking 70-0. BYU 38 Washington 17. Fit to be Tyed? Montlake has all appendages in a clutter. Gators 41 Canes 17. Another lesson in how long it takes teams to come back after a Coordinator takes over as Head Coach (West Virginia, you’re next). Enjoy the game, and SCREAM YOUR GUTS out if you’re going to be in attendance. Longball here with this weeks fearless predictions. Why “fearless”? Because after pulling a rabbit from my hat with last week’s UCLA pick, I have clearly demonstrated my undeniable clairvoyance. Now, I hinted last week that I may be picking our beloved Cougs to pull the upset this weekend at a revitalized Martin Stadium. Apparently if I just type it here, it comes true. Right? Sadly Sedihawk informs me that ain’t how it works, folks. Even if I called it for the Cougs it wouldn’t be enough to help them overcome the Bears this week. Now this is not “da Bears” of Ditka, Sweetness, and the Fridge, but they do have something going for them… OUR special teams. There is just no way our special teams are going to let us win, or even compete in this football game. You can’t win college football games with Pop Warner special teams. I am thrilled that the few brave souls who actually suited up for us last weekend fought hard and all that, but we are a long way from being competitive within our conference. I do think with the new coaching staff at the helm we will continue to make strides, especially on offense, but please keep those expectations where they belong for now… low. But fear not, Brinkhater, I will be there screaming my guts out and losing my voice just like last week. ASU 35 Stanford 10. If the Beavs turn out to be good again, Harbough may have quietly already pulled off his big win for this year. Quack 42 Utah State 3 The Quack are playing D this year. Beavs 28 Penn State 24 Last week the tables were turned as some trees cut down the Beavers. Was it a wake up call? Oregon State travels across the country to play in Beaver Stadium. How could they lose? This is the kind of information my picks are based on. AZ 35 Toledo 24 I have no analysis for you on this one. Does anyone else find it hard to root for Stoops in non-conference games? BYU 42 Washington 28. Locker’s receivers actually hang on to some balls, but Husky D gets run over, thrown over and finally rolls over. I won’t apologize for saying this, I like watching Locker play. Gators 35 Canes 10 Hurricane season is here, but this wont even be a category 1. I hope Tebow washed his hands after performing all those circumcisions in the Philippines this off season. That has to rival the USC jock itch outbreak for the ickiest off season story that the ESPN guys won’t stop talking about! There it is. I hope I’m wrong and I see all of you at the page this Saturday night to drink some tubs and TURN THE HELMET! Greetings Coug Nation. Busy times these days, so we’ll go after it. Anywho, the Cal Bears. Are they all that after week one? Where are their minds coming into this one? Given our lack of “sexiness” as an opponent, it’s probably on pole-vaulter extraordinaire, Cal’s own Allison Stokke. Can you blame them? But anyway, I’m with the others here, and concerned about how we will handle their team speed. They looked exceptionally fast on TV Saturday night, and after coming back from the Okie State game and watching Cal run up and down the field, they looked a lot faster than the Pokes. I know it’s hard to tell sometimes, and that TV can make players look bigger/stronger/faster, but man, watching Jahvid Best and Shane Vereen carry the ball is going to be a breath-holding experience this Saturday. But Cal has some young WR’s, and this will be their first shot at starting a game in a hopefully loud, hostile environment. Much like UW this year, Cal has lost their top five WR’s from last year, and this will be the first time on the road that they have to do some heavy lifting. TE Cameron Morrah and Jahvid Best are the leading receivers from last season at 13 catches apiece, but that’s it. So, while I like Kevin Riley at QB as a guy who won’t torpedo their own offense (compared to Nate Longshore), I have a feeling things will be tougher for him this week. And speaking of Riley, did you know this will be just his third-ever start at Cal? And his first-ever start on the road? Yes, he’s been impressive, but he’s never had to get under center in a loud stadium as a starter and make things happen. So, I think on defense we get after it. We will pack the box, try and slow down the running game, and make Riley and his young WR’s beat us over the top. But if Cal can run the ball, they can also eat game clock and best of all, when you are on the road? Nothing takes a crowd out of a game more than a visitor running the ball at will, chewing up yardage on the ground as well as keeping the ball away from your offense. And I think that’s exactly what Tedford and company are going to try to do. One area that we have a shot here is the passing game. In my mind, it seemed as though Michigan State had a little bit too easy of a time throwing the ball. They had an experienced QB, and a potential breakout star at WR in Mark Dell who went bananas on their secondary. Now that the game one yips are out of our young WR’s collective systems, I don’t know, call me crazy but I think Rogers has a solid day. And given how Dell played in week one, and how disappointed Gibson was with his first game, don’t you think they’ll come out ready for a huge game? I do. But will it be enough? Unfortunately, no, I don’t think we’ll be standing at the top of the hill at the end of the day. But I am going to say, here and now, that this will be a much, much closer game than some are predicting. Look, Cal is good, and they looked tough on Saturday, but these guys are NOT USC. And only USC has been such a big favorite at WSU in the last decade as Cal is this weekend. Plus, remember how everyone said last year ASU was going to kill us in Pullman? ASU was a nine point favorite coming in undefeated, but we were a missed field goal from going to OT in that game, and a controversial call from possibly winning it on Brandon Gibson’s TD catch that was reversed via replay. I think people are over-reacting to week one, which is a very, very easy thing to do. You are never that bad, but you are also never THAT good either. Things will come around, and we will be pleasantly surprised by what we see. Paul Wulff already said that he’s expecting an extremely hard-hitting, physical game, and we will respond with some true toughness. I’m calling Cal 27, WSU 23. ASU 31, Stanford 16. ASU is really good and Stanford was a bit of a mirage in week one, outgained by almost 200 yards by the Beavs. Rudy Carpenter will not make the same mistakes made by Lyle Moevao. Reality arrives via Erickson and company. Oregon 49, Utah State 7. What can you say? Stat game, all the way. Oregon State 34, Penn State 28. I’m with Longball here. Oregon State moved the ball at will vs. Stanford, and they won’t make the same mistakes in week two. Sammie Stroughter makes them far, far better on offense than they’ve been in a long time. AZ 35, Toledo 17. Tons of offense, again, out of the not-so-Mildcats. They can’t possibly keep up the pace they set last week vs. the Vandals…can they?? Washington 27, BYU 24 – Shocker of the weekend. Everyone has written off UW, and it seems as though the Willingham era is kaput. But somehow, someway, I see UW pulling this one off. Locker will be better, but not by a huge margin. The big difference here will be how effective UW is in running the football. I think the UW offensive line plays a much better game against a BYU defense returning only three starters from last year. And BYU might be good, but they don’t have the same athletes as the Pac-10. I see a very similar game like Boise State last year, a team everyone said was going to kill UW. But in watching that game, while Boise State had some talent, they clearly had trouble on the road against Pac-10 athletes. The gap between BCS and non-BCS conferences has closed, but there is still a difference. I know UW is down, but, I think they respond. Thug Bowl – Florida 31, Miami, FL 20 – Brinkhater is right. Miami with Larry Coker is yet another example of what happens when you promote the old coordinator to head coach. The long-term damage can be too much. And Brinkhater is right, West Virginia, you’re next! There you have it. Remember, it’s still early. We will likely see some wild swings in performance, by many teams in the country. Don’t fall into the trap of placing too much value into what you see the first week in the season, because it can all change on a dime. Did everyone write of Michigan last year after they lost to App State and Oregon, at the Big House? They ended up winning nine games, including a win over the Tim Tebow’s in their bowl game. Everyone thought Cal and Oregon were Rose Bowl contenders given their hot starts, but both teams faded badly down the stretch. So you just never know. There’s a TON of season left! Is There Really That Much Improvement in Week Two? For WSU, it’s time to look forward. Saturday’s loss is gone, and hopefully lessons were learned. The coach-speak of week one to week two will be on full display this coming Saturday, so, let’s see what happens. Speaking of week one to week two improvement….is it actually true?? Mmmm, sort of. I looked back at the last five years of our games, starting with 2003, and in some cases it IS true, some, not so much. 2003: Beat Idaho 25-0 in Seattle, then lost to Notre Dame 29-26 in OT. Note – They were sluggish at times vs. Idaho in Kegel’s first start since 2000. Lots of field goals in this one as the team struggled in the red zone. This was Cody Boyd’s first appearance and he looked great, blocking a couple of Idaho field goal attempts to preserve the shutout. Things were better early vs. the Irish, in a game they sprinted out to a huge lead but couldn’t hold on…in Ty Willingham’s first game at ND, and, current Seahawk RB Julius Jones ran wild in the second half vs. a tired WSU defense. But overall improvement? Not really. 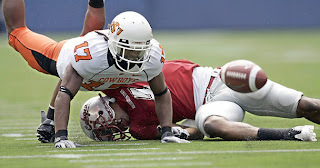 2004: Slogged through a comeback win at New Mexico 21-17, then lost to Colorado 20-12 in Seattle. Note: Swogger rallied the Cougs in his first-ever start vs. New Mexico, throwing two fourth-quarter TD’s. But the next week it all fell apart, as the WR’s dropped an amazing amount of passes in the first half (reportedly 8 or 9 true “drops”) and Swogger lost his cool. Brink comes in, gives them a spark yet also fumbles twice and throws an INT returned for a TD. Improvement?? NO. 2005: Struggled a bit with Idaho, winning just 38-26, but then went to Nevada and destroyed the Wolfpack 55-21 in week two. Note: This might be the biggest example of how much better a team can look from week one to week two. The Idaho game was a weird one, with two TD’s in the first three minutes of the game for a lightning quick 14-0 lead. But then Idaho snuck back into it and made it interesting before WSU pulled away. But the week two blowout on the road was huge. Brink went crazy, the defense made plays, basically everything went well. The other side to the coin? That was also Nevada’s first game of the season, and they looked off in every way. What people forget is Nevada would go on to a bowl-winning season in 2005, looking absolutely nothing like the team we played in their season opener. Just a classic example of how different things can look from week one to week two. Improvement?? YES! 2006: Hung tough but blown out late, 40-14 at Auburn. Stormed back to crush Idaho 56-10 in week two. Note: The end-result was great, sure. Week one was one of the worst-ever performances by Brink at WSU, just 11-for-24 for 67 yards (sound familiar to Gary’s line on Saturday?). We looked overwhelmed by the SEC speed. Idaho’s defense must have looked like statues compared to Auburn, and the results showed. We had over 300 yards of offense at the HALF, and would go on for an amazing 56 points and 637 total yards, including 344 rushing yards. But there is no other way to say it, other than Idaho was a BAD football team. This was Erickson’s first season, and they had a lack of talent and depth across the board. And let’s face it, that 2006 WSU team was one of our best non-bowl teams in recent history. Improvement? Yes. 2007: Hung tough with Wisconsin before getting blown out late, 42-21. Bounced back with a runaway victory in Seattle over San Diego State, 45-17. Note: Just 328 total yards vs. Wisc but a whopping 654 yards vs. SD State, another huge offensive improvement. Brink had one of his best stat-games, throwing for 469 and 5 TD’s, as well as a school record 38 completions. The WR’s were unreal this day, as Gibson, Bumpus and Charles Dillon all went over 100 yards receiving, and made several spectacular catches along the way. Obviously the quality of the opponent has to be taken into consideration. Wisconsin was an excellent football team last year, while SD State? Still rebuilding, to put it kindly. And oh yeah, SD State’s season opener was our second game, and they did not look good. Improvement? Yes. Bottom line: Week one to week two, at least in recent times, does look promising. But the quality of the opponent and the timing of when you play them has to be taken into consideration. Cal is a quality, bowl-winning team from 2007, just like Okie State. This isn’t Idaho or some other weakling to improve or shore up some issues. It’s out of the frying pan, into the fire this week. Plus, let’s not get too excited after only one game. Beano Cook said it best on Saturday night, in that it is very easy to overvalue or undervalue things after just one game. You have to give it a few weeks and see how things settle down. Some teams look like world-beaters early on, but will come back to the pack over the next week or two. Meanwhile some teams look like they can’t walk and chew gum at the same time, but things can change in a big way the next week. It happens every year, so why should 2008 be any different? Speaking of this week, let’s take a quick look at Cal to start off Labor Day. Last week: Beat Michigan State 38-31. Offensively Cal was impressive, racking up 467 yards, including 264 yards passing and 203 yards rushing. Balance has been a staple with Jeff Tedford’s offense, and this was no exception. Cal’s young skill position guys were impressive, as both Jahvid Best and Shane Vereen went over 100 yards rushing. Vereen broke MSU’s heart with an 81-yard TD run with just over 4 minutes left, right after State cut the lead to seven, and that was the ballgame. Cal’s QB controversy appears over, as Kevin Riley was in complete control with an efficient 17-for-24 for 202 yards and a couple of scores. Nate Longshore was 3-for-5 with 62 yards and a couple of INT’s, including one in the end zone on a throw he tried to force into triple coverage. Expect Riley to go the whole way this week, other than maybe one or two series out of Longshore just to keep him fresh. The Cal defense was less than impressive however. Cal has switched to a new 3-4 defense, and MSU looked pretty good, with 23 first downs and over 400 yards of total offense, including 321 yards passing. Sophomore WR Mark Dell lit up the Cal secondary, catching nine balls for 202 yards, averaging 22 yards per catch. He almost had one of the best TD catches you will ever see, but upon replay, they took the catch away as he didn’t quite have control of the ball. But he was unstoppable for much of this game. One word of warning – Cal’s special teams could be a huge problem. Jahvid Best had over 100 yards in kickoff returns, including a long of 35 yards. He’s a home run threat anyway, every time he touches the football, but he’s the last guy you want to see getting a kickoff and blockers in front of him. Plus, Cal got a TD on a blocked punt for the first TD of the 2008 season, something that really fired them up. Finally, the Cal punter, frosh Bryan Anger, was amazing, with a net of 48 yards on four punts, including three downed inside the 20 and a long of 59. As we all know, special teams can be the tipping point in a tight ballgame. Let’s hope things are cleaned up, fast, or else we could be in some big trouble. Finally, hopes and prayers are sent our way towards the New Orleans – Gulf of Mexico area. Let’s hope the levees hold up. Thank God they evacuated so many people in advance, and the lessons learned from Katrina appear to be saving tons of lives. Good luck to you all. You are currently browsing the archives for the Shane Vereen category.